Bath Cats and Dogs Home in Somerset is at maximum capacity and the centre is blaming the recession. The home has seen an increase in the number of discarded dogs, cats and small pets requiring treatment as owners find vet bills too expensive. 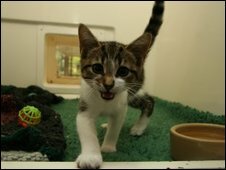 The centre is responsible for 100 dogs, 80 cats, 100 kittens and 40 small animals such as rabbits and hamsters. Sarah Thorn, fundraising manager for the home, said: "We are always full but now we are very full - and we are taking in more. "We are managing to re-house animals but at a much slower rate than normal. "We have a waiting list for dogs and cats but still take in strays as we have a contract with the council. "We have noticed that we are getting far more animals with big vet bills." The open day on Sunday starts at 1100 BST and 5,000 people are expected.